OCEANSIDE is described by many as a “little Carmel.” Driving into the village one is presented with a picturesque scene of quaint cottages & substantial luxury homes studding the hillside overlooking miles of sandy beach & majestic offshore Three Arch Rocks Wildlife Preserve. Nearly every home enjoys spectacular ocean views, some all the way to forested headlands of Cape Lookout and 2.5 mile Netarts Bay Spit. Only 8 miles to Tillamook with its major hospital, supermarkets, YMCA, movie theater, performing arts center, bowling, skating, fairgrounds, and so much more. Also, just 90 minutes to downtown Portland and 20 minutes closer than that to major shopping centers in the suburbs. Bus service, community potlucks, art shows, caves for spelunking, and glorious long sandy beaches. Off the beaten path of Hwy 101, this jewel by the water is stylish, but quiet and uncommercialized. THE VILLAGE is a way of referring to the central part of older Oceanside where homes spring up out of Maxwell Mountain's hillside like a little Swiss Village. And Swiss is an appropriate reference here because this hillside was once dotted with sheep kept by Swiss farming families. Today, nearly every home has an oceanview in the village, which is also home to 3 good restaurants and 3 affordable oceanfront motels. That's it for commercial establishments, however. The rest of the 500 or so properties are all residential and most homes in the village area were built from the 40's through the 70's. The lots are generally tiny because they were once platted at tent lots where loggers camped. THE CAPES is a spectacular gated community in Oceanside which was started in the early 90's on a 79 acre oceanfront parcel. 100 of the 180 parcels are beautiful craftsman style townhomes between 1600 and 2000 sq ft. There are 9 condos and the balance are lots and detached homes. The Capes has a full time manager, a tennis court, bocce ball court, a community facility, playground, woodsy trails and 2 beach accesses. CAMELOT is a neighborhood built out mostly in the late 60's & 70's. It's tucked away in the hills South of the village where most people are surprised to find houses. Covenants designed to protect the incredible ocean views are an attraction, and there is a stairway/trail for beach access. Three Arch Rocks sunset. Maxwell Point on Right. TERRASEA is also part of Oceanside. Large homes on lots generally over 1/3 acre, with spectacular oceanviews and protective covenants, are the norm in this upscale neighborhood. AVALON & OCEANPINES & TRILLIUM are subdivisions lining the outskirts of Oceanside, where many building lots are still potentially available for development. To find Oceanside, just travel West from Portland on Hwy 26, taking the Hwy 6 cutoff to Tillamook through the Wilson River valley and the Tillamook Forest. 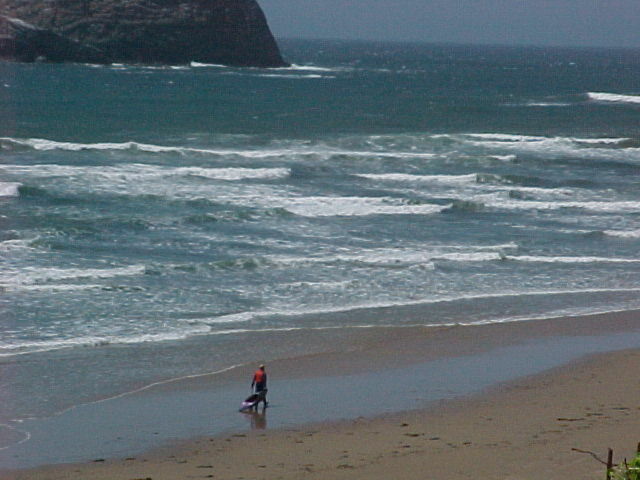 Once in Tillamook, follow the signs to Oceanside which is another 8 miles West of Tillamook.